Francis Hopkinson was a man of extraordinary talent and charm. Born into a family of substance in Philadelphia, he was the first scholar and first Graduate of the College of Philadelphia, which his father, along with good friend Benjamin Franklin, played a role in chartering. He studied Law in the office of Benjamin Chew (later, Chief Justice of Pennsylvania) and then continued his education in England, two years study with the Bishop of Worcester. He was a writer of music, poetry and satire. His notable works include "A Pretty Story," a skeptical examination of the relationship between Great Britain and the colonies, and "Battle of the Kegs," a satiric taunting of the British. Hopkinson claimed credit for designing the American flag, but the evidence for his claim is not clear. 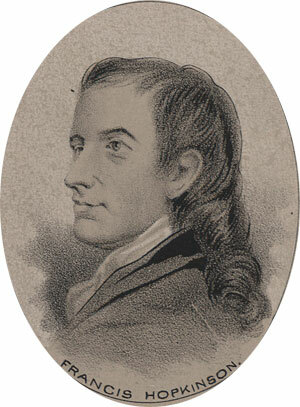 Hopkinson was elected a delegate to the Continental Congress in 1776, where he signed the Declaration. After the War he was an active advocate, in speaking and in writing, for the New Federal constitution. He was commissioned a Judge of Admiralty in Pennsylvania in 1780, and Washington appointed him Federal District Judge for his native state in 1790. He died very suddenly of a massive epileptic seizure in 1791, at the still young age of 53.